Waterford, MI – Sometimes communities put a lot of planning into projects – like parking decks and road improvements – but forget that as these projects start, there are needs of the residents and businesses in the area that are impacted by the work. 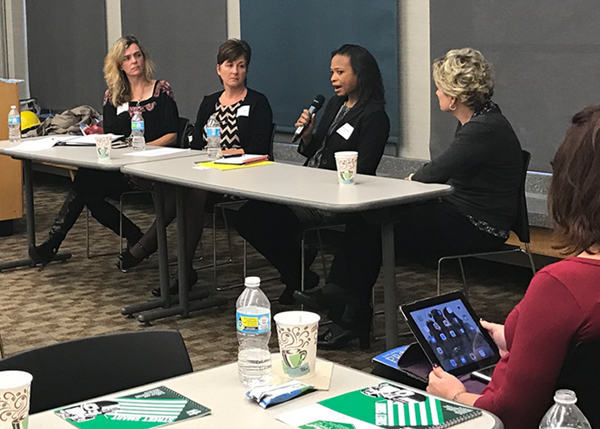 That’s why Main Street Oakland County and Oakland County Economic Development and Community Affairs hosted the “Street Smart” Workshop earlier this month at the Executive Offices in Waterford. 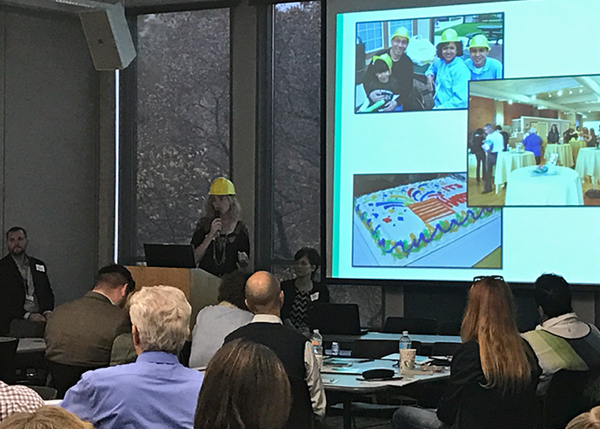 Administrators and DDA representatives from throughout Oakland County gathered to talk about their previous project woes, and learn from communities that have successfully made infrastructure projects not only tolerable – but actually fun. Jill Bahm, MSOC Advisory Board Chairperson, led the effort to gather information from communities about their successes and challenges. “The one thing we took from everybody is to start planning early. Involve businesses, churches, residents and community groups,” she said. Making sure concerns are met early in the process is part of good planning. For example, planners in Clarkston learned early on that historic preservation was a concern when bringing in heavy construction equipment to work on M-15, which is the community’s Main Street. In order to protect the limestone foundations of the buildings, MDOT used vibration-free construction methods that meant there was no damage done to the fragile foundations of the historic buildings. In Birmingham, officials knew parking would be an issue during construction, so they offered free valet for downtown shoppers, with their first two hours of parking free. Other communities have used parking lots outside of downtown and used shuttles to move workers and shoppers. Bahm also recommended that when projects come up, to look for ways to combine multiple projects into one effort. For example, sewer and roadwork can be combined with streetscape improvements so that residents and businesses have something to see and be proud of when the work is over. An example of this was the W. 9 Mile project in Ferndale, where the DDA and City worked together to have a “How the West was One” theme, showing how improvements would help draw the Downtown Ferndale vibe further west because of improvements like flower beds, flashing light crosswalks, and parking bays made of permeable pavement. In Rochester such work was combined with tree removal and replacement. Large trees that had been obstructing the historic facades were replaced with smaller ones, giving businesses more exposure while maintaining the quaint, walkable feel. Business owners were encouraged to come up with ideas also. In Farmington one business started a home-delivery program, and Painting with a Twist owner Michelle Lewis made giant signs and used her email list to let customers know they were still open and to use the back entrance. An important lesson was knowing to allocate money for communication into infrastructure projects. Signage is important, as is knowing how to update stakeholders through the process. Consistent updates are important to stakeholders, as is knowing where they can go for the latest information. Facebook updates can be done on the City page as well as a special page for the project. Cable channel updates, updates at council meetings and working with local media all help residents and businesses know what is going on, and that concerns are heard. Communities also learned through experience that the images put out about the development matter. Renderings should show vibrant colors, completed landscaping, public art and other expected features, and of course happy people enjoying the new space. Being prepared to listen to naysayers and correct misinformation is also essential. “You have to pay attention to the resistance and to what it’s trying to tell you, said one of the panelists during the discussion. Communities talked about keeping the conversation positive, making sure people are heard respectfully, and that facts are out there without seeming like an argument against the nay-sayers. Because there are almost always nay-sayers. “Imagine a celebration of infrastructure,” said Annette Knowles of the Farmington DDA. 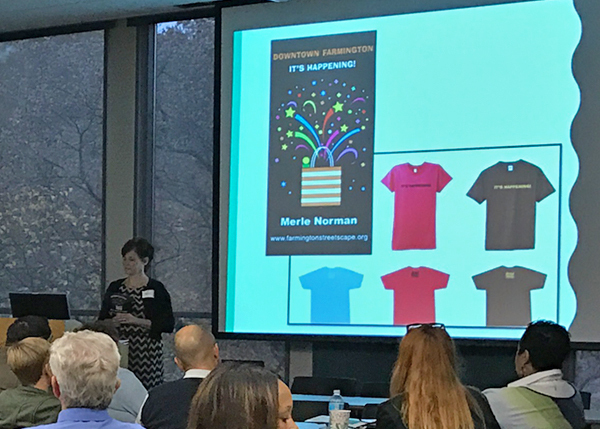 She and former Promotions Assistant of the Farmington DDA Dana Walker presented information about the “It’s Happening!” campaign that went along with changes to Grand River Avenue. The slogan “It’s Happening!” led to the inevitable “What’s happening?” question, opening the door for conversations. After years of figuring out funding and scope for the project, when they were ready to actually do the work there was a lot of misinformation and old information out there. So they made a video that explained the project and included a local historian, city officials and business owners. “It’s Happening!” appeared all over town, including a banner across Grand River, t shirts available at many stores, and on toy hard hats given out at events. 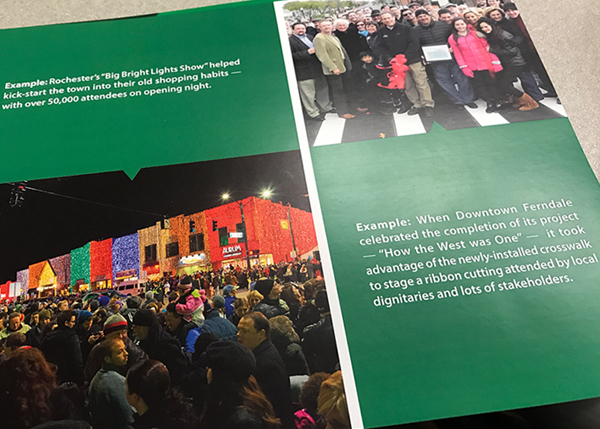 To start off on the right foot with businesses, the DDA gave a packet to businesses that included items with the “It’s Happening!” theme. Other items included Life Savers, rubber bands to remind them to be flexible, band-aids to help with healing, tea to help them relax, candles to remind them there is a light at the end of the tunnel, candy kisses to give them love and affection and a hand-signed note from the DDA Director to let them know they were personally thought of. Merchants participated in a program where shoppers could buy a reusable “It’s Happening!” bag, and every Tuesday there were sales and giveaways for people that had the bag. Regular communication – with the theme – was also important. They did weekly meetings for businesses to give them updates. They were determined and active in the construction process, not just passively waiting for updates from the construction contractors. And updates were shared not only at the meetings, but online and through a front-page ad campaign in the local weekly newspaper. The ads gave updates that were compelling for people to read, and they featured a business each week that was open during construction. Downtown Ferndale’s “How the West was One” theme used some of the same ideas, but on a much smaller budget. Their focus was on social media and in-person updates with businesses – all with a country-western theme. Downtown Birmingham also tried to make construction fun, by having a day for families to come out and play in the torn up roadway. They gave out construction hats, had construction-themed games, and let children explore the big, exciting construction equipment. Tied into that were sales at surrounding businesses. Bahm also stressed the importance of celebrating when the project is done. She suggested having a ribbon-cutting and a party if possible, and making sure business owners and shoppers are included. Knowles said it helps to have ways to demonstrate and measure success after a project, like increased shoppers to the area, more people enjoying public spaces etc. Ongoing celebrations of success help soothe the sore spots left by the construction’s impact. And, she added, communication momentum should continue with businesses even after projects are done. “Good communication is like laundry, it’s never done,” she said. To learn more about Main Street Oakland County, visit their website at https://www.oakgov.com/advantageoakland/programs/Pages/main-street.aspx.